The 1248 offers a lot of interface for the money, not to mention MOTU’s take on networked audio. Standards are a good thing, it’s said, which is why we need lots of them. The old joke was never so true as in the field of networked audio. Everyone agrees that sending music down Cat5 cables is the future; but until the future arrives, the present looks like a bit of a mess. If you dig around on Wikipedia, you’ll find a table entitled ‘Comparison of audio network protocols’ which lists no fewer than 18 different ways of transmitting audio from A to B, C or D. Not all of these are still viable options, by any means, but the likes of Dante, Ravenna, Aviom, Digigrid and AVB all have powerful adherents in high-end live-sound circles. Some of them are making headway in the project-studio market too, thanks in part to a new breed of audio interface that combines local and networked I/O and connects to a host computer using familiar USB or Thunderbolt cables. Focusrite’s take on this concept, reviewed in the May issue of SOS, is the Red 4Pre: a premium 1U Thunderbolt interface which has a versatile selection of analogue I/O on board, plus the capacity to be expanded locally using ADAT and S/PDIF, or over Ethernet using Dante-compatible remote preamps, mixers, headphone amps and so forth. However, the Red 4Pre was not the first audio interface to offer this sort of blend of features. That honour probably goes to the subject of this review, the 1248 from Mark Of The Unicorn. Like many manufacturers, MOTU responded to the demise of the FireWire standard by introducing a range of audio interfaces that can connect using the Thunderbolt protocol. Launched back in 2014, the 1248, 8M and 16A feature different combinations of local I/O, but all can be expanded over Ethernet. Rather than embracing the proprietary Dante protocol for networked audio expansion, however, MOTU have chosen to support the open AVB standard. MOTU’s Thunderbolt interfaces also offer the ability to connect to a host computer over USB 2 or USB 3, helping to broaden their appeal in the Windows world where Thunderbolt is still a rarity. However, only one cable is supplied, and in a world where a 2m Thunderbolt cable retails at about £35$30 and USB cables can be had for pennies, you can probably guess which it is! Each of the three interfaces has extensive built-in digital mixing and signal processing, and each also probably has sufficient local I/O for many project-studio applications (with the caveat that none have MIDI I/O). The 16A offers 16 line-level inputs and outputs on balanced TRS jacks, while the 8M features eight on-board mic preamps with ‘combi’ XLR/jack sockets and eight line outputs on jacks. Both also offer up to 16 channels of ADAT-format digital I/O on the usual optical sockets. Most versatile of the three, however, is the 1248, which boasts four mic preamps, two high-impedance inputs for guitars and eight line inputs on balanced jacks, plus word-clock, stereo S/PDIF and dual ADAT optical connections. There are stereo Main and Monitor outputs on jacks, plus eight further line outs and two independent front-panel headphone outputs. And, of course, there’s that RJ45 connector which opens up the world of AVB expansion. All of this is somehow crammed into a 1U rack case while leaving room for a built-in mains transformer and, on the front panel, a large white-on-blue display that allows simultaneous metering of all the analogue ins and outs, the S/PDIF I/O, and eight ADAT in and out channels. It’s worth noting, too, that all of MOTU’s current interfaces offer extremely impressive audio specifications. The analogue outputs, for instance, are said to have a real-world dynamic range of 123dB — better even than that achieved by the Focusrite Red 4Pre — while the line and mic inputs boast 117 and 118 dB respectively, with a THD+Noise figure of -110dB across the board. And, like the Red 4Pre and an increasing number of other audio interfaces, the 8M and 1248 feature digitally controlled mic preamps which allow gain to be set in precise 1dB steps. To my mind, this is a big improvement over the fiddly and non-linear potentiometers typically found in older and cheaper interface preamps, especially where you need to match gain across channels for stereo recording. Another nice touch is that the levels of the line inputs and outputs can also be trimmed by ±12dB. Physically speaking, the 1248 is functional rather than beautiful. Its ‘none more black’ case is made from a hard plastic, which gives it an air of toughness and allows it to be quite lightweight and portable. Each of the four mic preamps has a rotary encoder that is used to set gain, plus pad and phantom power buttons. These encoders also have alternate housekeeping functions, accessed by pushing them. Two more encoders adjust the gain of the front-panel guitar inputs, and there are also encoders for the levels at the two headphone outputs and the Main and Monitor line outs. These last two can be pushed to mute the outputs, but that’s about as far as front-panel monitor control goes. If you want more sophisticated features such as 5.1 level control, speaker selection, mono, dim or talkback, you’ll need to implement them in software or use a separate monitor controller. There’s a healthy amount of analogue I/O packed into the 1248’s back panel, not to mention the USB, Thunderbolt and RJ45 connections. Over the years, we’ve become used to the idea that multi-channel audio interfaces typically come with utility software that handles setup duties and provides low-latency cue mixing. All of that functionality and more is available on these interfaces, but it’s not accessed hrough a dedicated utility. Instead, the 1248’s internal DSP is controlled from a page running in your Web browser, launched from a small application called MOTU AVB Discovery. Like so much music software today, said page is about as cheerful-looking as Adrian Mole’s bedroom walls, but once you’ve turned up the brightness on your monitor, it quickly becomes apparent that the 1248’s DSP is powerful and sophisticated. In fact, it forms a full-on 48-input digital mixer, of the sort you might expect to encounter on a decent-sized live-sound gig. Each input channel has not only the usual fader, pan, mute, solo and stereo-link options, but also a high-pass filter, a gate, an SSL-style four-band equaliser and a highly configurable compressor modelled after the classic Teletronix LA2A, plus switchable pre/post-fader sends to seven stereo aux buses, three groups and a built-in reverb. And when I say “each input channel”, I don’t only mean the mic and line inputs: the exact same features are available on all 48 inputs into the mixer, regardless of which physical inputs they are connected to. Presets can be stored independently for the mixer as a whole, entire channel strips, and individual elements such as the EQ and compressor. There is a limit to the total amount of DSP resources available, but I never managed to approach it, and about the only real limitation I could identify is that it doesn’t seem to be possible to change the order of the processing on each channel, not that I’d often want to. The 1248’s browser-based mixing software. With great power, however, comes great complexity, and I’m sure I’m not the first 1248 user who found the whole thing quite intimidating to begin with. To help get you started, there’s a ‘Quick Setup’ option which offers a choice of eight different preset configurations: Audio Interface, Stand-alone Mixer, Interface + Mixer, and so on. Choosing Audio Interface in effect disables the DSP mixer, on the assumption that you just want to address the 1248’s I/O directly from within your DAW and handle cue mixing and monitoring in software. Given that the 1248 is capable of quite impressive low-latency operation if your computer can handle it (see box), this is certainly the simplest way to use it for recording. 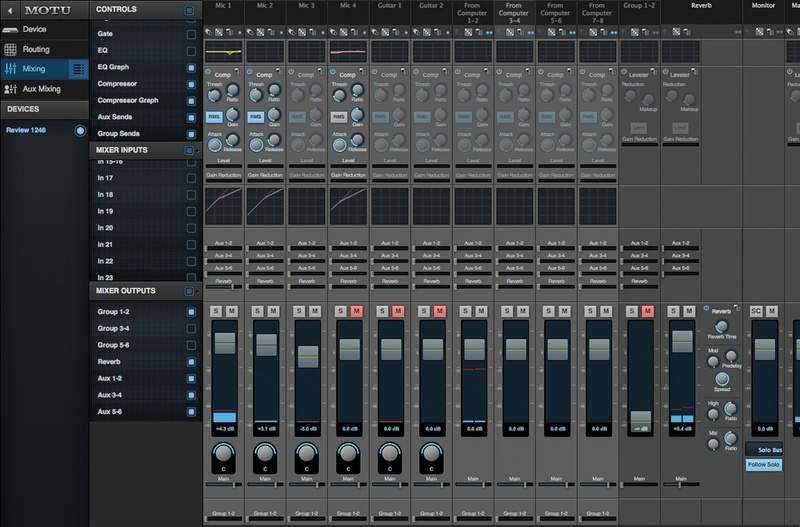 Even in Audio Interface mode, though, there’s still plenty to tinker with in the Device setup panel. One thing that caught me out on a few occasions is that settings made in this area allow the 1248 to present different numbers and combinations of inputs and outputs to your recording software, and it’s important to get these right. At base sample rates, up to 64 inputs and outputs are available over USB, and up to 128 over Thunderbolt; but, as you’d expect, these numbers fall at higher sample rates. These input and output connections are sourced from various ‘banks’ of physical I/O — mic inputs, guitar inputs, line ins, S/PDIF, optical A and B, and up to 16 eight-channel AVB streams — which can be enabled or disabled separately. Pro Tools users will find that the inputs available to them appear to be auto-named, and not aways correctly, which can get confusing. If you do wish to take advantage of the 1248’s powerful DSP mixer in a recording context, you’d typically want to take the Interface + Mixer option as a starting point in the Quick Setup dialogue. You can then take a deep breath and embrace the joys of the Routing, Mixing and Aux Mixing control panels. The first time you do this, you’ll be struck by one of the main negative aspects of MOTU’s browser-based interface: switching between these panels within the same browser window is painfully slow. It often takes several seconds to serve each page, which is extremely frustrating if you’re repeatedly moving between them, as one often needs to. A workaround is to have them all open simultaneously in different browser tabs, but actually setting this up is a bit fiddly, and it would be nice to have the option for AVB Discovery to do it automatically. Given that there are four tabs per interface, it would also get pretty unwieldy in situations where you’re combining multiple MOTU AVB units. The 1248’s routing matrix includes not only all the physical inputs and outputs, but also all the inputs and outputs for the DSP mixer, including pre- and post-effect channel outputs. So if, for some reason, you want to route all your aux buses into the computer to record your cue mixes, or record your vocals with baked-in compression and EQ, you can. The down side is that you will spend a lot of time squinting at small blue squares. 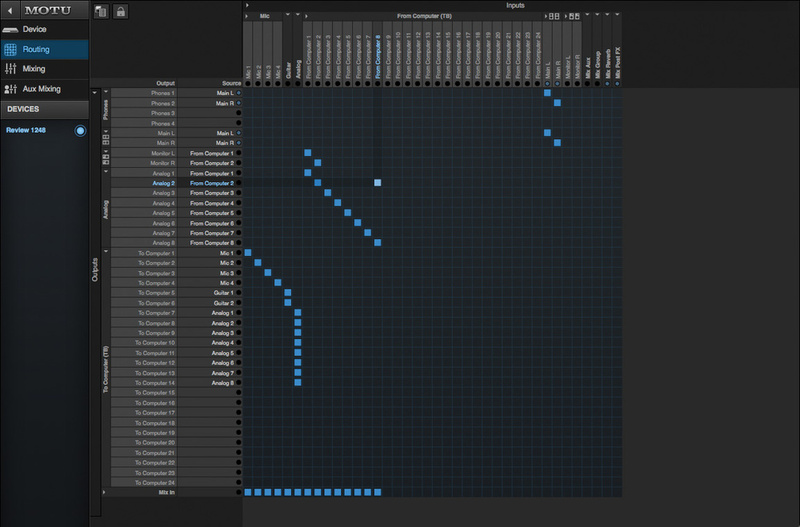 Large though the routing matrix is, however, it can usually be made to fit on screen. Not so the Mixing panel, unless you have a mahoosive monitor, restrict it to a handful of channels, or zoom out to the point of illegibility. Fortunately, it’s easy to show and hide different elements of the mixer; so if, like me, you rarely use EQ or dynamics in a cue mix, you can simply leave them hidden and claim back enough screen space to avoid any need for vertical scrolling. Once configured, it works very much like any other on-screen mixer. The DSP effects sounded very good to my ears, and with so many aux and group buses available, I can’t imagine ever exhausting the power available even on the most complex session. Other manufacturers such as PreSonus have released apps that allow their interfaces’ DSP to be controlled remotely from iPads and the like, and in theory, the use of a browser-based setup extends this flexibility further, because you don’t need a specially coded app in order to interact with the 1248. Any device that can run a browser and can see the 1248 on a wired or wireless network should be able to control it. In combination with the sheer power of the DSP, this opens up some interesting possibilities. For instance, each member of the band could use a phone or tablet to control his or her own cue mix. 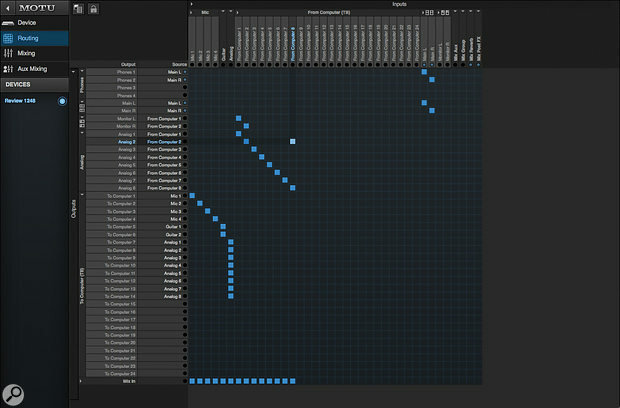 This is a scenario MOTU have anticipated by building in the Aux Mixing view, which presents a single bank of aux sends as faders. They’ve also thoughtfully added the option to lock out the Routing view so that meddling fingers can’t disrupt things mid-take. The flip side of this is that a Web browser isn’t optimised for the task of controlling a complex DSP mixer, and doesn’t quite feel like the right tool for the job. 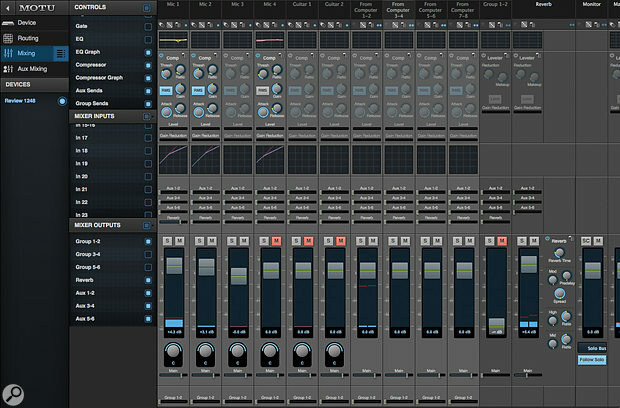 Everything works, and MOTU have done some pretty neat coding to mimic the features you often get in dedicated cue-mixing and control utilities — the pop-out graphical EQ editors are particularly impressive — but the look and feel aren’t as satisfying as a well-written stand-alone program can be. Fader movements and scrolling can be jerky, and the controls seem a touch slower to respond than those in a DAW or dedicated cue-mixing utility: not enough to cause serious frustration, but sufficient to make them feel a bit clumsy and unappealing to use. Likewise, from a graphical point of view the interface is stodgy and inelegant, but perhaps this is inevitable given how much more information it has to present. Most of all, though, the sheer complexity of it all can be confusing. Quite a few times during the review period I found myself wondering why nothing was coming out of the headphones, or why something I could hear wasn’t visible in the mixer. There was always a logical explanation, but I can’t truthfully say I enjoyed using it or got to a point where it became intuitive. In the event, thankfully, I didn’t encounter any seven-piece bands requiring individual iPhone-controlled headphone mixes during the review period. The 1248’s ability to operate at low latency means that in practice, it’s often possible to use the browser only for configuration, and ignore the mixer entirely. For the sessions I did encounter, the 1248 proved more than adequately equipped. It worked happily under its internal clock, and also locked contentedly to the ADAT signal from a remote preamp. The digitally controlled preamps did a fine job, and with the switchable pad on top of the 63dB gain range, cater for inputs at almost any level. (The same can’t be said of the guitar inputs, though; oddly, these have the same ±12dB gain range as the line inputs, and there were times I could have wished for more poke.) On the output side, the headphone amps have plenty of welly and sound clean and clear. In theory, the 1248’s comprehensive hardware metering is a clear plus compared with most rival interfaces, offering more detail and requiring no bank changes other than between the two ADAT banks. In practice, though, this is undermined by the fact that there’s no clear indication of overs, either on the front panel or within the browser-based mixer view. 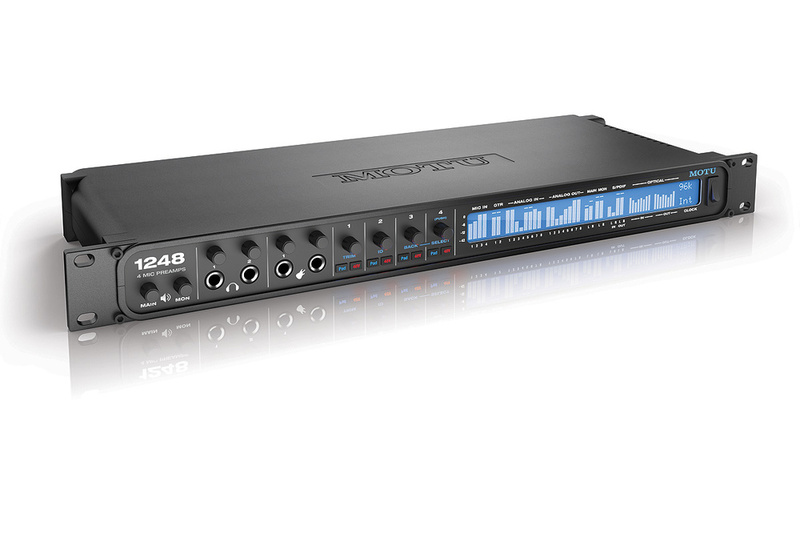 As an all-in-one offering for project studios, the 1248 is a pretty complete product. The only obvious omissions relate to monitor control and communication with artists; I’d really like to see alternate speaker switching, plus a talkback button and internal mic as found on the PreSonus Studio 192 and Apogee Ensemble Thunderbolt. As it is, talkback switching would have to be done on-screen rather than using a physical control, which is never ideal. But that’s a fairly minor niggle in the context of what you do get. The 1248 is particularly impressive when viewed in comparison with Focusrite’s Red 4Pre. The only significant Red 4Pre feature not available here is the ability to act as an interface for Pro Tools HDX (which, I suspect, will be the biggest market for the Red 4Pre). The 1248’s complement of on-board I/O is slightly more generous and available on full-sized connectors rather than D-Subs, it gives nothing away in terms of audio specs and sound quality, and it’s even more expandable — on top of which, it offers USB connection as an alternative to Thunderbolt, and is Windows-compatible now rather than at an unspecified point in the future. Oh, and did I mention that it’s substantially less expensive? In such a comparison, the main thing in the Red 4Pre’s favour is a slicker and more streamlined user experience. Absolutely everything is controllable from the front panel, and the Focusrite Control utility is much more pleasant to engage with than MOTU’s browser-based interface. True, it doesn’t have the same turbocharged DSP mixer inside it, but if you don’t need this DSP, you’ll get things done more quickly and with less fuss. It remains to be seen whether AVB will win out in the battle of the networked audio protocols, but like Focusrite with their RedNet range, MOTU already offer enough different expansion options that you could cater for most requirements without the need to consider third-party products. And even if you disregard AVB completely, the 1248 still looks excellent value for money. Even widening the field to include USB-only interfaces, I know of nothing available at the same cost that provides a similar complement of I/O and comparable audio specifications. If you’re looking for a great-sounding project-studio interface that has the potential to grow into a bigger role, you ignore MOTU’s range at your peril. One of the main advantages of Thunderbolt over older protocols such as FireWire and USB is the potential for operation at very low latency, and manufacturers such as Focusrite and Apogee have managed to achieve the sort of performance that was previously possible only with PCI-based interfaces. This partly reflects the fact that Thunderbolt is, to many intents and purposes, an extension of the PCI bus. However, I suspect that a contributory factor is the fact that manufacturers seem to be developing Thunderbolt drivers in-house, rather than depending on generic third-party offerings. This contrasts with the majority of multi-channel FireWire and USB interfaces, which typically use Apple’s generic class-compliant driver on the Mac, and off-the-shelf driver code such as that supplied by TC Applied Technologies on Windows. MOTU echo other manufacturers in claiming very low latency over Thunderbolt, while an interesting development occurred on the USB front during the review period. Originally, the 1248 and the rest of its family used Apple’s class-compliant USB driver on Mac OS, and a third-party Windows driver which is familiar from a number of other interfaces. However, MOTU have also been working on developing their own custom driver, which became available in beta form shortly before we went to press. This doesn’t seem to change the Mac Thunderbolt support, but offers lower latency on both platforms for USB connection, and enables operation with Thunderbolt on Windows for the first time. Thunderbolt probably wasn’t even a glint in Intel’s eye when my Windows PC was designed, so I wasn’t able to test this, but the new USB ASIO driver was certainly impressive. If your computer can handle it, this offers buffer sizes down to an implausibly low 12 samples(!). As mentioned, my Windows machine is now four and a half years old, so I wasn’t surprised to find that the 12- and 16-sample settings didn’t work at all. At 32 samples I was able to use Oblique Audio’s RTL Utility to measure the round-trip latency as a pretty impressive 3.5ms at 44.1kHz, a figure that closely matched the reported latency in Cubase 8. However, I wasn’t quite able to achieve crackle-free recording and playback until I raised the buffer size to 64 samples, with a round-trip latency of 7.3ms at the same sample rate. CPU load was still fairly high, but this compares very well with other USB interfaces I’ve tested on the same machine, and I’ve no doubt that on a more modern computer it should be possible to operate with a 32-sample buffer or smaller and achieve latency figures that are about as good as it gets over USB. The bulk of my testing took place on a slightly more modern MacBook Air running Mac OS 10.9.5. With a Thunderbolt connection, I was able to record and play back audio in Logic at the lowest 32-sample buffer size at 44.1kHz. The reported round-trip latency was 2.2ms, but a loopback test suggested the true figure was more like 3.2ms — still very impressive! I was also able to use the original class-compliant USB driver at a 32-sample buffer size; oddly, the true round-trip latency of 5.4ms was actually slightly lower than that reported by Logic. Installing the custom driver knocked about 1.5ms off the USB round-trip latency times at each buffer size, but I was no longer able to use the 32-sample setting without crackles appearing in the output. The conclusion seems to be that it should be possible to achieve sub-4ms round-trip latency on both platforms, even over USB, but you’ll need a modern computer and can expect a fairly heavy CPU burden. Before leaving the always-fascinating world of latency and audio drivers, though, I should point out that the sailing was not quite so plain when it came to using Pro Tools 12 on my Mac. At first, I was plagued by CPU spikes and overload messages even on Thunderbolt, at all but the highest 1024-sample buffer setting. MOTU’s UK distributors, Musictrack, suggested this was because by default the 1248 presents more I/O channels than Pro Tools can see (it being limited to 32 inputs and outputs in native mode). On their advice, I reconfigured the 1248 to present only 32 ins and outs, and this did improve things, but I still got occasional CPU spikes at buffer sizes which were no problem for Logic, and occasional weird behaviour I couldn’t put my finger on. I also found that when I opened very complex Pro Tools mix sessions, I was getting CPU overload errors with the 1248 that weren’t happening with the Mac’s on-board I/O. It’s also worth pointing out that, like the Focusrite Red 4Pre, the 1248 doesn’t compensate for any additional latency introduced by the AVB network or devices on it. So, in a fully expanded system where you’re combining native analogue, ADAT and AVB inputs and outputs, these will not be perfectly time-aligned. The difference is likely to be negligible in many circumstances, but if you want to retain phase accuracy between multiple mics or sample-accurate sync between different outputs, they’ll need all to be routed to the same bank of inputs or outputs. In order that we could try out the 1248’s AVB connectivity, MOTU’s UK distributors Musictrack kindly lent us one of the ‘expander’ devices in the AVB range. Actually, describing the Stage-B16 as an expander is to do it an injustice, because it’s perfectly capable of operating either as a stand-alone, remote-controlled digital mixer, or as an audio interface. In all of its roles, it has 16 mic inputs on female XLRs, eight line outputs on male XLRs, and four channels of AES3 digital output, plus a single stereo headphone output. There’s no Thunderbolt port, but a USB socket enables it to be hooked up to a computer, and a locking RJ45 socket is your bridge to AVB world. Describing the Stage-B16 as an 'expander' is to do it an injustice, because it’s perfectly capable of operating either as a stand-alone, remote-controlled digital mixer, or as an audio interface. Internally, the Stage-B16 has exactly the same DSP mixing and routing facilities as are found in the 1248, and these are controlled in the same way through MOTU’s browser-based interface. I didn’t get the opportunity to try it out as a live-sound mixer, and in all honesty, after a few bouts with Firefox and the 1248 I wasn’t that keen to do so. As an AVB expander for the 1248, however, I found it pretty straightforward to set up. Applying mains power and hooking up an Ethernet cable between the B16 and the 1248 allowed it to be recognised by the AVB Discovery utility, and setup was straightforward. Each device on the AVB network can ‘publish’ up to 16 output streams, each containing eight audio channels; and each device can also accept up to 16 input streams, sourced from any of the other devices’ output streams. So, once I’d configured the Stage-B16 to output two banks of eight channels from its mic inputs, these showed up as input options within the 1248’s Device page. It was then straightforward to feed them into its routing matrix and my DAW software. As mentioned in the main text, the DSP mixer used in all of these interfaces can accept a maximum of 48 channels, so if you’re only adding a single B16, it makes sense to do all your cue mixing within the 1248’s mixer. In larger setups where you’re recording more than 48 channels, it would perhaps make more sense to use each B16’s own mixer to create stem mixes and work with these in the 1248’s mixer; while, in theory, you could address a large live-sound gig by using AVB to create shared aux send buses and so forth that were passed between multiple units. Either way, it should be possible to achieve your preferred way of working, though some effort might be required at the configuration stage! As well has the 1248 and the other two Thunderbolt interfaces mentioned in the main text, MOTU’s AVB range has grown to include a number of additional products. All of them contain the same powerful DSP mixer as the 1248, with AVB networking and class-compliant USB 2 connection, but the only one that has Thunderbolt connectivity is the latest version of the versatile 828 audio interface. The 828x has two mic preamps and a main stereo output pair on XLRs, plus eight line ins and outs on jacks, and 16 channels of ADAT digital I/O, plus S/PDIF, word clock and MIDI. The portable UltraLite AVB dispenses with the Thunderbolt connector and some of the I/O, but still offers up to 18 ins and outs across all formats. The other products in the range are designed primarily as expanders, for use within larger systems, though the USB connectivity means you could use them as stand-alone interfaces if they happen to suit your needs. The 24Ai and 24Ao respectively provide 24 analogue line-level inputs and outputs, plus three banks of ADAT optical I/O, while the 112D combines 24 channels each of ADAT and AES3 I/O with 64 channels of MADI I/O. The Monitor 8 is a dedicated monitor mixer with six independent headphone outputs, providing almost unlimited opportunities for musicians to tinker with their own cue mixes on their smartphones. Finally, there’s the Stage-B16, described in the box above. Though it still remains to be seen which of the many networked audio protocols eventually wins out, AVB does have one potential advantage in the project-studio sphere: it is natively supported in Mac OS X, meaning that, in theory, it should be possible to get audio in and out of something like the 1248 using an Ethernet cable alone. However, latency is said to be a fair bit higher than with a Thunderbolt or USB interface, so the only real advantage in doing this is that AVB devices can be connected over a long cable run. Very low round-trip latency is achievable even over USB. Includes a powerful 48-channel internal DSP mixer, controllable from any device that can browse the Web. Versatile range of on-board I/O and expansion options, with a wide range of compatible expanders also available from MOTU. Supports Thunderbolt and USB operation on both Mac OS and Windows. Can be complex to set up. A web browser isn’t the ideal means of interacting with the built-in DSP, and there’s a lengthy wait when switching between pages. Minimal monitor control functions, and no talkback. Metering does not clearly indicate overs. Seems slightly more demanding of CPU resources than some interfaces. MOTU’s range of AVB-compatible Thunderbolt and USB interfaces is the most comprehensive attempt yet to combine the on-board I/O that a project studio needs with the scalability required in other applications. The 1248 has impressive audio specifications, works well at low latency, and boasts a very powerful DSP mixer, though this can be complicated to set up and cumbersome to use. 1248 £1199, Stage-B16 £1356. Prices include VAT.